Descrizione: This collection brings together the chamber output of prolific and varied composer Giuseppe Martucci. The pieces on this disc span roughly ten years of his career, the earliest of which – the Sonata in F sharp minor Op.52 – was composed when Martucci was just 24. Thanks in part to his exploration of Neopoliatan music salons, however, the work nevertheless has a distinct richness and maturity to go alongside the young composer’s creativity. These qualities only become more pronounced as we are taken to Tre Pezzi Op.69, a trio of pieces for the piano and cello that are ‘among the foremost chamber works of the entire late 1800s’, and which Martucci was later to transcribe for orchestra. So significant was this trio that Martucci continued to write the chamber music of which he was so fond throughout his career, first at the urging of his publishers and later as a refuge from more demanding compositions. The pieces that emerged from this – the Due Romanze and Melodia Op.71 (later transcribed into a Romanza) – make up the latter half of the disc. Having won several prizes in cello competitions all over the world, acclaimed Italian cellist Roberto Trainini now appears regularly as a soloist in as many as ten countries. He is joined on this recording by fellow countryman Massimiliano Ferrati, who has been described as ‘one of the most impressive Italian musicians of his generation’. - Recorded in 2013 in Italy and Poland. 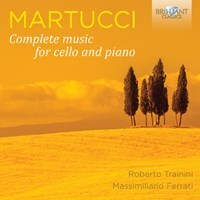 - This new recording brings together the complete output for cello and piano by Martucci. - Giuseppe Martucci was one of the most important composers of the second half of the 19th century. His mostly instrumental oeuvre is based on the romantics Schumann and Brahms, but shines with a special golden Italian glow and sparkle. - Played with passion and command by two Italians of international reputation: cellist Roberto Trainini and pianist Massimiliano Ferrati. - The main work is the Cello Sonata, written when he was 24, but of a stunning maturity and “gravitas”, a masterwork in its genre, which deserves to be heard more often in today’s concert halls. Also included are the Tre Pezzi (3 pieces) which Martucci later transcribed for orchestra. - Booklet contains extensive notes on the music as well as artist biographies.